"Orkesta Mendoza's mix of cumbia, mambo, indie and Tex-Mex psychedelia - all in well-cut suits - comes to the UK. Their brash, widescreen style and witty reference to 60s instrumental pop is both effortlessly classy and enormous fun. 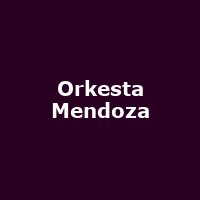 Orkesta Mendoza is led by Mexican American kingpin Sergio Mendoza, who is also a member and co-producer of Tucson music legends Calexico, and arranger and founder member of Mexrrissey."